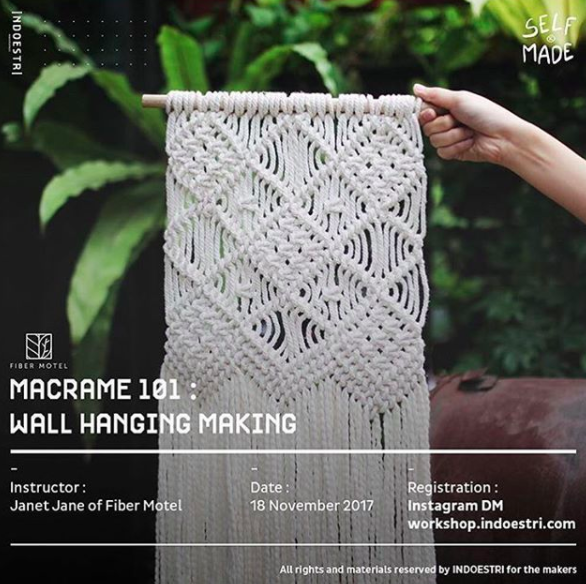 This month we’re having another Macrame Workshop at Indoestri Makerspace. This will be our 3rd wall hanging workshop that we’ve conducted this year! Every now and then we lose touch with the real world and get so consumed with technology. Macramé is an activity that is raw and real. It’s relaxing and meditative, and the best part is you only need your hands and some rope. 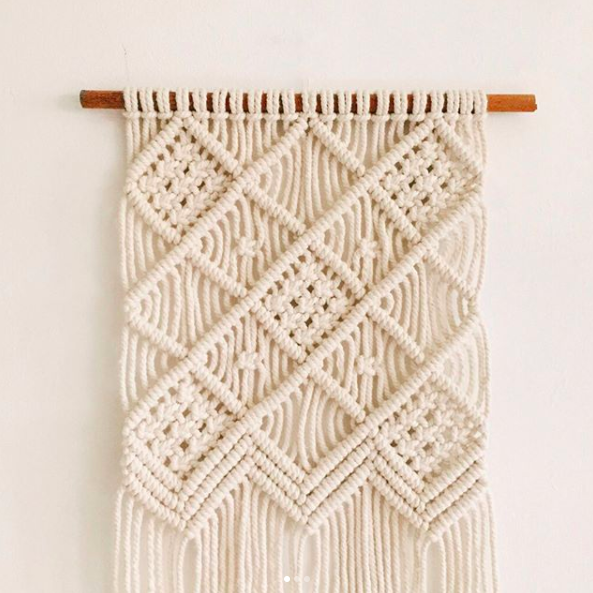 You will learn all the basics of macramé and make your very own wall hanging. The pattern is provided, but you can definitely create your own and get as creative as you like! This is one of our best selling wall tapestry and also the pattern you will be learning! Our workshops are super fun and there’s no pressure at all. You will be amongst others who are also starting macramé, so we’ll all be learning together! Go to www.indoestri.com to sign up. If you can’t make it, don’t worry we also have private workshops. Go to our workshops page! Last weekend, we were invited by our friends at Indoestri Makerspace to conduct a live demo at Brightspot Market at PIK Avenue, Jakarta. We enjoy doing macramé live demos as it shows the effort that goes into making a macramé piece. Demos are especially useful for those who are thinking of joining one of our workshops. It’s been a while since I posted a blog post, which is unfortunate – since truth be told I quite enjoy writing. But all the macramé making has kept me quite busy. As the cliché quote goes, it is both a blessing and a curse…. to be able to do everything by yourself. Anyways, this post is going to be about what Fiber Motel’s identity. First, let’s talk about where the name comes from. But then again, there’s not really much to talk about. It has no deeper meaning nor deeper substance. It is just because I wanted the brand name to have something that relates to macramé but I didn’t want to actually use the word macramé. I went to business school, and as every business person knows – there’s always a plan to expand, even if you don’t know what you’re doing yet. So that’s why I opted to go with the word Fiber. At the time, I didn’t know exactly where it was going, but I knew that I wanted it to be something more than just macramé. As for the ‘motel’ part – well, I just really like that word. See? Simple. It’s been 9 months since Fiber Motel officially launched, and through those 9 months, I’ve learned a lot. I have tested and tried paths on where Fiber Motel could go. And now I think, we’re there – for the most part. Fiber Motel’s products are designed for those who believe in aesthetic consciousness. When I first heard the term a couple years back, the first thought that came to my mind was “that sounds so f*cking pretentious”. And now, I actually still think that but the difference is, I might have fallen into that category myself – whether deliberate or not. Anyways, what is aesthetic consciousness? I’m going to explain it to you in a way where I don’t sound more like a pretentious pompous.  Basically aesthetic consciousness is being aware of what something looks like rather than just being aware of it’s function. It’s being aware that something was designed to actually look like that. For example, when you look at an expensive chair, most people see that it’s just something to sit on. But for those who are aesthetically conscious, they will see that it’s made really well, or designed really well. So that’s that. Moving on, that’s what we want to do. We want to make people see, that our products – as functional as they may be, there’s also a lot of thought and effort and energy that goes in the process of making that certain product. And here’s something that I copy-pasted from our about page. Being so connected to technology, it is easy to forget the real world around us. We want to encourage our consumers to get back to the basics, and appreciate the real things that surround us. We believe that macramé is one of those things. For us, the art is meditative and refreshing. It’s raw and natural. All of our products are made with a lot of love and made mindfully. With that in mind, we also want to share the process of macramé with others through our workshops and courses. We all know the famous saying from our favorite HBO show ‘Winter Is Coming’. Well as much as we love Game of Thrones and Winter (which is non-existent in our beloved Indonesia), we won’t be doing a winter collection anytime soon. To celebrate our favorite HBO Show releasing it’s 7th season in July, we’ve decided to do a SUMMER IS COMING collection around the same time! Anyways, our summer collection is our most fun one yet! Vibrant and colorful, we can’t stop looking at it especially with the touch of color we added to our pieces. Yes, that’s right we’re FINALLY doing color. It was bound to happen. What are the colors you ask? Of course we had to start with our brand colors – blue, green and yellow – with added hues and variations. Our signature piece from this collection has to be our ZANIRA skirt hangers (see featured image) which comes with white ceramic pots. As you know, we value efficiency here at the motel, and to make it more efficient for you we’ve decided to include white ceramic pots to go with the ZANIRA Skirt Hangers, so you don’t have to think about which of your planter you want to hang there. You can simply take our white ceramic pot to your local nursery and have them place your greeneries in there, or you could do it yourself (we prefer the latter btw). The ZANIRA skirt hangers are obviously handmade… but fun fact – they’re also hand-dyed. As much as we love to go all natural, we went with synthetic dye for this pieces. They come in 3 colors – tyrell green, stark blue and martell yellow (for those of you GoT fans, see what we did there?). More updates to come. Stay tuned. 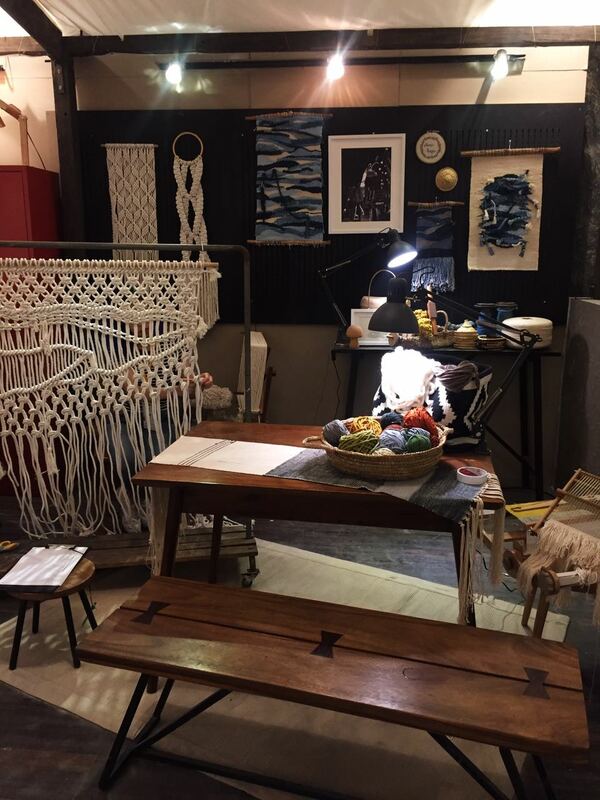 Fiber Motel is a creative studio focusing on the art of macramé, adapting it into modern living items. We create one-of-a-kind handmade pieces accustomed to your aesthetic needs.